Romanzo d’infanzia is a performance where the language of dance-theatre, normally reserved for an adult audience, is given a more direct narrative form to make it accessible to children. Childhood is like the diamond of our lives, rough and dazzling. But the power of its light can be damaged or dulled. Is this a bad thing? I cannot say, but I do know that it hurts, hurts a great deal. If it is true that you can go crazy for love, it is even truer that you can go mad and be very unhappy without it. And what a tragedy it is for children who have too much love or none at all. Children are among the eternal weak. We believe that to be different is a right which must be re-affirmed at all times, in all countries. It is always time to stand with the underdog or defend the weak. These premises underline the work method influencing and defining this drama above all and our work with the dancer-actors, perceived as more than mere characters in a text because they provide a precious, vital human contribution. Romanzo d’infanzia is about children who are ill at ease in close relationships. It is about physical and psychological violence in homes and institutions and the crime of not listening to one’s own children. It is about offences without offenders. On stage the two dancers are by turns parents and children, father and son, mother and daughter, brother and sister - yes, above all brother and sister, endlessly see-sawing between submission and rebellion, escape and self-defence, flight and return, or the threat of being stolen away forever with no return. Life, in other words. This is dedicated to those who cannot survive without love. The appeal this has to the child in me makes this such an excellent piece of theatre. The moment of the two actor-dancers is captivating. They work beautifully together, producing an impression of complete continuity in an energetic piece. Tomaso and Nina live their lives enterey together - what they do together alone is for them more important than anything else. It is an inspired production dealing with a very difficult topic with imagination and highly skilled performances. Revealing what we often forget - that children have insight and perception although they are young, by seeing their world from their eyes. With its absolute novelty of expression and highly original, refined and gently ironical blend of theatre and dance-theatre, Romanzo d’infanzia evokes vivid nostalgia for the unforgettable, top-quality children’s theatre of the early days. So what a joy Romanzo d’infanzia is for young audiences (who respond enthusiastically) and will be for adults at evening performances. Joy and discomfort, happiness and malaise: never-ending applause. It takes you to where deep emotions resonate. Rare, intense physicality onstage, both abstract and true at the same time. Minimalistic yet full of sincere, direct communicative energy. Those normally more critical seemed to have to surrender to the perfect harmony, the magical equilibrium of sweet sensitivity and explosive strength representing the pains of childhood, the anxiety to grow up and the scars that can never fade. And the response was unanimous. Michele Abbondanza and Antonella Bertoni bring this cruel-funny story to life […] with joyous energy. The inventiveness and virtuosity of their choreography give wings and lightness to this rather harsh tale. Sometimes, thanks to a sort of miraculous amalgam with components hard to trace, the fairytale archetypes are theatrically transformed into images, words and sounds that make their energy palpable, as it were. And when this happens fear and desire, games and escape, death and laughter, love and anger are all there onstage and inside the spectator (adult or child) at the same time. Which is exactly what takes place, for instance, in one of this year’s performances: Romanzo d’infanzia. Spontaneity, grace, sensitivity, intelligence and freshness are words that come to mind in all their essentiality to define the “lightness” of this theatrical choreography. The creators have pulled off what they set out to accomplish: without trickery or deception the freshness of the Abbondanza-Bertoni duo manages to seduce the adults and enchant the children. Romanzo d’infanzia had the Sociale audience captivated and moved by a blend of acting and dance that exploited each distinct language to the full without relying on improvisation. Bertoni and Abbondanza manage to play with the body and bend it to the demands of poetry. The four creators combine words and gesture in a single whole, not by seeking a superficial evenness of tone but by shortcircuiting the abstract gestures of dance and storytelling. At the final curtain the audience bursts into applause after a theatrical lesson to be remembered. It takes spectators through an amazing vortex of invention, movement and communication between stage and audience in a sometimes-tender, sometimes-cruel exploration of the worlds of adults and children, the figurative violence depicted with a mixture of joy, sadness and biting humour. Children should be the ones to take their parents to the Teatro Valle so the latter can meditate on and understand how their way is often not the right way to love . Without doubt a dance-theatre masterpiece, because the language of dance matches that of words unfailingly. A great success. Sometimes all it takes is two performers (Abbondanza and Bertoni, one of our best duos), profound ideas and creative talent to provide us will real emotions. Our inner world can thus be drawn out to animate the stage and be shared with others. This is what takes takes place in Romanzo d’infanzia, a real gem of drama and poetic magnetism by the Quintavalla, Stori, Abbondanza and Bertoni group. […] an excellent hour-long performance combining theatre and dance in an overwhelming explosion of energy. Deeply moved yet again by the absolute beauty and unforgettable emotions of Romanzo d’Infanzia, words once more fail to capture the complexity and fresh, direct lightness of this creation […]. A fine performance evoking everything from tenderness to anger and rebellion in response to the condition the protagonists face. […] With great intensity sustained throughout the show and an ability to deeply move audiences both connoisseur and non alike, the talent of this duo is apparent to all. […] Romanzo d’Infanzia, an extraordinary dance-theatre performance put together by the Compagnia Abbondanza-Bertoni, one of the top artistic examples of high quality dance-theatre in Italy today. The performance takes the form of dance-theatre “seasoned” with keen intelligence, savvy (minimalist) stage-sense and tragicomical, spot-on timing. So children or adults in the audience cannot help but identify with and see themselves in the memories, in the voices that filled the hours and rooms of childhood. A difficult tale told with irony, liveliness and vivacity, aided by a choreography full of inventiveness and virtuosity. Divided equally between dance, music and prose, the story is performed magnificently by Michele Abbondanza and Antonella Bertoni. Their story is that of growth and growing up, with all the dreams, sibling complicity, arguments and misunderstandings with parents […]. And the rest is a perturbing fresco of a not-always-beloved childhood rendered, for the stage, in perfectly timed action, incredible musicality and non-stop inventiveness. With repeated success. 1997. Teatro Testoni – Bologna (prima nazionale); Teatro Testori – Forlì; Teatro Rossini – Lugo (RA); Piazza Garibaldi - Montecosaro (MC); Drodesera Festival – Teatro Oratorio - Dro (TN); Teatro Circus – Pescara; Teatro Ariosto – Reggio Emilia; Teatro delle Maddalene – Padova;Teatro Petrella – Longiano. 1998. Teatro Al Parco – Parma; Teatro Civico – La Spezia; Teatro Comunale – Ferrara; Teatro Sperimentale – Trento; Teatro Filodrammatici - Treviglio (BG); Teatro Astra - Copparo (FE); Teatreno – Mantova; Teatro delle Erbe – Milano; Teatro S. Matteo – Piacenza; Teatro Nuovo – Como; Teatro Raffaello Sanzio – Urbino; Teatro Araldo – Torino; Teatro Masini – Faenza; Teatro Kismet Opera – Bari; Teatro San Matteo – Piacenza; Casa della Comunità – Nago (TN); Teatro Garibaldi – Settimo Torinese; Teatro Fraschini – Pavia; Festival Adda Danza – Piazza - Vaprio d’Adda (MI); Piazzale della Fara – Bergamo; Teatro Sperimentale – Ancona. 1999. Teatro Quattro Mori – Livorno; Teatro Astra – Vicenza; Teatro Concordia – S. Benedetto del Tronto (AP); Teatro di Villa dei Leoni – Mira (VE); Teatro Ponchielli – Cremona; Teatro Sociale – Soresina (CR); Teatro Modena – Genova; Teatro Comunale Chiabrera – Savona; Teatro Comunale – Casalmaggiore (CR); Palacongressi – Riva del Garda (TN); CRT-Teatro dell’Arte – Milano; Pergine Spettacolo Aperto - Teatro Tenda – Pergine (TN); BassanoOperaEstate - Giardini Parolini – Bassano (VI); Chiostro ex Collegio Vescovile – Este (PD); Villa Murri – Porto San Elpidio (AP); Teatro Herberia – Rubiera (RE). 2000. Teatro Valle – Roma; Teatro Zandonai – Rovereto (TN); Teatro Comunale Gries – Bolzano; Teatro Rossini – Gioia del Colle (BA); Teatro Morlacchi – Perugia; Casinò Municipale – Arco (TN); Fabbrica Europa - Ex Stazione Leopolda – Firenze; Teatro Piccolo Regio – Torino. 2001. Sala Arcipelago - Pianoro (BO); Teatro Al Parco – Parma; Teatro Amiata - Abbadia S. Salvatore (SI); Teatro Il Rivellino - Tuscania (VT); Teatro Verdi – Salerno; Cantieri Teatrali Koreja – Lecce; Teatro Duni – Matera; Teatro Mengoni - Magione (PG); Teatro della Società – Lecco; Teatro Filarmonico Comunale – Piove di Sacco (PD); Teatro Auditorium – Jerago; Teatro Alighieri – Ravenna; Abbazia di San Zeno Pisa; Teatro Sociale - Alba (CN). 2002. Teatro Libero – Palermo; Auditorium S. Chiara – Trento; Teatro dei Rinnovati – Siena; Quale Percussione? – Centro Culturale Polivalente – Marano sul Panaro (MO); Teatro Pia Marta – Brescia; Teatro Giardino - S. Giorgio delle Pertiche (PD); Teatro Lux - Camisano Vicentino (VI); Nonsolodanza - Teatro Comunale di Cavalese – Cavalese (TN); Teatro Savoia – Campobasso; Teatro Auditorium – Cagliari; PadovaDanza - Centro Congressi Altaforum – Campodarsego (PD); CRT- Teatro dell’Arte – Milano; Teatro Ventidio Basso – Ascoli Piceno. 2003. Teatro Lauro Rossi – Macerata; Centro Torrazza – Zola Predosa (BO); Rassegna NoTuNo - Casinò Municipale – Arco (TN); Teatro Animosi – Carrara; ITC Teatro di San Lazzaro – S. Lazzaro di Savena (BO); Castello Pasquini– Castiglioncello (LI). 2004. Teatro Sociale – Como; Casa della Comunità – Nago; Teatro Giuditta Pasta – Saronno; Teatro Jolly – Olginate; Senza Confini - Teatro della Tosse – Genova. 2005. Teatro Metropolitan – Piombino (LI); Incantamenti - Teatro Politeama - Cascina; Artisti per Alcamo - Teatro Cielo d’Alcamo – Alcamo (TP); Anteprima Festival Nazionale di Teatro Ragazzi - Teatro Anzani – Satriano di Lucania (PZ). 2006. Viareggio Primavera Danza - Teatro Jenco – Viareggio (LU); Cine Teatro Rocco Gentile - Cittanova (RC); Festival Internazionale Sogni d’infanzia - Teatro Ariston –Mantova. 2007. Teatro delle Briciole – Teatro al Parco – Parma; Teatro Pubblico Pugliese - Teatro Curci – Barletta (BA); Teatro Pubblico Pugliese - Teatro Rossini – Gioia del Colle (BA); Teatro Civico – La Spezia; Sala Suffragio – Medicina (BO); Teatro Testoni – Bologna; Teatro Asioli – Correggio (RE); Teatro Testoni – Casalecchio (BO); Teatro Comunale – Ferrara; Teatro Gabbiano – Ghedi (BS); Fondazione Culturale di Gallarate - Teatro Condominio Vittorio Gassman - Gallarate; Teatro Comunale - Modena; Cantieri Teatrali Koreja - Lecce. 2008. Teatro Goldoni - Venezia; Teatro Dario Fo - Camponogara (VE); Teatro Cinema Astra – Schio (VI); Teatro Comunale – Casalpusterlengo (LO); Casa del Teatro – Torino; Teatro Comunale – Magenta(MI); Teatro del lido – Ostia; Teatro di Tradizione Dante Alighieri – Ravenna; Teatro Pacini – Pescia; Sala Jacopo da Ponte – Bassano del Grappa (VI); Tèatre D’Ou - Sauz d'oulx (TO); Treviso – Teatro delle Voci; Tione (TN) – Teatro Comunale; Pergine (TN) – Teatro Don Bosco. 2009. Bolzano – Teatro Cristallo; Udine – Teatro Nuovo Giovanni da Udine; Teatro Modena – Genova; Auditorium Melotti – Rovereto; Teatro dell’Archivolto – Genova; Teatro Verdi – Padova; CRT Teatro dell’Arte – Milano; Teatro Manzoni – Pistoia; Teatro Comunale – Alessandria; Teatro Pubblico – Foggia; Teatro Comunale - Belluno. 2010. Casalgrande (RE) – Teatro De André; Massa – Teatro Guglielmi; Firenze – Cantiere Florida; Scenario Pubblico – Catania; Teatro Manzoni – Merate (LC); Teatro Comunale – Lecco. 2011. Bergamo – Teatro Sociale; Limbiate (MB) – Teatro Comunale; Bari – Teatro Piccinni, Teatro Comunale – Cles (TN); Teatro Comunale – Sondrio; Teatro Comunale – Nardò (LE); Teatro Verdi – Corsico (MI). 2012. Teatro al parco – Parma; Teatro della Rosa – Pontremoli (MS); Teatro Tatà – Taranto; Teatro Traetta – Bitonto (BA); Teatro Comunale – Massafra (TA); Teatro Fabbricone (PI); Teatro Bertagnolio – Chiaverano (TO); Teatro Auditorium – Trento; Teatro Tenda – Mirandola (MO). 2013. Teatro Torti – Bevagna (PG); Teatro Era – Pontedera (PI); Palacongressi – Riva del Garda (TN); Teatro della Rocca – Novellara (RE); Palafiemme – Cavalese (TN). 2014. Teatro Mignon – Tirano (SO); Teatro Zandonai – Rovereto (TN). 2015. Artificerie Almagià – Ravenna; Teatro Camploy – Verona; Teatro Sartori – Ala (TN); Casa del Teatro – Faenza (RA). 2016. Teatro Monte Baldo – Brentonico (TN); Teatro Massimo - Cagliari; Teatro Vespasiano - Rieti; Teatro Sperimentale - Pesaro; Teatro Zandonai - Rovereto (TN). 2017. Teatro Comunale - Casalmaggiore (BR); Teatro Testoni - Bologna; Teatro Comunale - Novoli (LE); Teatro Garibaldi - Bisceglie (BAT); Teatro Nuovo - Treviglio (BS); Casa del Teatro Ragazzi e Giovani - Torino; Teatro Flavio Vespasiano - Rieti; Auditorium Costa - Sezze (LT). 2018. Teatro Maggiore - Verbania; Teatro Civico - Vercelli; Teatro Sociale Gustavo Modena - Mori (TN); Teatro Metastasio - Prato; Teatro Diego Fabbri - Forlì; Teatro Niccolini - San Casciano Val di Pesa (FI); Teatro Biblioteca Quarticciolo - Roma; Teatro Nuovo - Napoli; Villa Murri - Porto Sant'Elpidio (FM). 1997. Halle (Germania); Théâtre Athénor – St. Nazaire (Francia). 1998. Théâtre Massalia – Marseille (Francia); Salle Simone Signoret - Vitry-le-François (Francia); Blickfelder Festival – Rote Fabrik - Zurigo (Svizzera); Theatre im Zentrum – Stuttgart (Germania); Complex Culturel et Sportif – Simiane-Collongue (Francia); Espace A. Malraux – Chambéry (Francia). 1999. Théâtre Copeau – St. Etienne (Francia); Salle Daniel Féry – Nanterre (Francia); Le Manège – Maubege (Francia) ; Festival Méli Môme - Association Nova Villa – Reims (Francia); MJC de Kerfeunteun – Quimper (Francia); Biennale Jeunes Publics - Théâtre du Point du Jour – Lyon (Francia); Théâtre des Jeunes Spectateurs – Montreuil (Francia). 2000. Festival Panoptikum - Tafelhalle – Nurnberg (Germania); Théâtre de la Sinne – Mulhouse (Francia); Centre Culturel Jean l’Hote – Neuves-Maisons (Francia); Espace Pierre Dac – Châlons-sur-Marne (Francia); Espace 600 Le Cargo – Grenoble (Francia); Am Stram Gram – Le Théâtre - Génève (Svizzera); Espace Lino Ventura – La Ferme du Buisson - Marne-la-Vallée (Francia); Maison des Arts et de la Culture – Créteil (Francia); Théâtre du Casino - Biarritz (Francia); Théâtre Palace Périgueux (Francia); Théâtre Fémina – Bordeaux (Francia); Théâtre G. Laygues – Villeneuve-sur-Lot (Francia); Les coups de théâtre - Agora de la Danse - Montréal (Canada); La Rotonde - Québec (Canada). 2001. Festival Rebonds - Théâtre d’Albi - Albi (Francia); Le Parvis - Tarbes (Francia); Théâtre de la Cité - Toulouse (Francia); Espace Olivier Carol - Foix (Francia); Salle Vox - Théâtre de Cherbourg - Cherbourg (Francia); Espace André Malraux – Chevilly-Larue (Francia); Salle Lino Ventura – Centre Culturel de l’Athis Mons (Francia); Halle aux Grains – Blois (Francia); Scottish Children’s Festival - Traverse Theatre – Edinburgh (UK); Festival Banaanikala - Lindakivi Cultural Centre - Tallinn (Estonia); Casa della Cultura Croata - Rijeka (Croazia); Le Théâtre – Nîmes (Francia). 2002. Centre Culturel de Ramonville - Ramonville (Francia); Marionnettissimo - Théâtre Municipal - Muret (Francia); L’Agora - Salle Robert de Lacaze - Billère (Francia); Centre Culturel Les Colonnes - Blanquefort (Francia); Teatro Olympia–Arcachon (Francia); Blickfelder Festival - Theater an der Sihl – Zurigo (Svizzera); Vorstadt- Theater – Basel (Svizzera); Teatralia 2002 - Sala Cuarta Pared – Madrid (Spagna); Teatralia 2002 - Teatro Salòn Cervantes - Alcalà de Henares (Spagna); Maison du Théâtre et de la Danse - Salle A. Vitez – Epinay-sur-Seine (Francia); Salle des Malassis - Bagnolet (Francia); Forum Culturel - Grande Salle – Le Blanc-Mesnil (Francia); Espace Culturel André Malraux – Le Kremlin (Francia); Kulturhaus Lingby (Danimarca); Le Théâtre - Narbonne (Francia); Centre d’Action et de Développement Culturel - Bastia (Francia); International Dance Festival - The Ark – Dublino (Irlanda); Young at Art - Stranmillis Theatre - Belfast (UK); The Place – Londra (UK); Kilkenny Arts Festival - St. Canice’s Hall – Kilkenny (Irlanda). 2003. Scottish International Children’s Festival - MacRobert Arts Centre - Stirling (UK), Eden Court Theatre - Inverness (UK); The International Theatre Chekhov Festival - Hermitage Theatre – Moscow (Russia); Festival Golden Stick - MOJE GLEDALIŠČE Kulturni dom Španski borci – Ljubljana (Slovenia); Festival Europalia – Salle Le Manège – Namur, Théâtre Marni – Bruxelles (Belgio). 2004. Festival Momix – Espace Tival – Kingersheim, L’Arche – Bethoncourt (Francia); Théâtre de Grasse – Grasse (Francia); Teatralia 2004 – Sala Cuarta Pared - Madrid (Spagna); Festival Jeune Public - Théâtre G. Philippe - Saint-Denis (Francia); Milk International Children’s Festival of the Arts – PDT Harbourfront Centre – Toronto (Canada); Percursos pelo Paìs 2004 - Centro Cultural de Belém – Lisbona, Teatro Garcia de Resende – Évora, Teatro Viriato – Viseu, Oficina Municipal Teatro - Coimbra - (Portogallo); Le Patio/Espace 600 – Grenoble (Francia); Scarabée/Espace Malraux - Chambéry (Francia). 2005. La Friche la Belle de Mai/Salle La Cartonnerie - Marsiglia (Francia); La Maison des Comoni – Le Revest les Eaux (Francia); Danse au coeur – Théâtre de Chartres – Chartres (Francia); Blickfelder tanzt aus der Reihe - Casino-Saal Aussersihl – Zurich (Svizzera); The Spark Festival - Phoenix Arts Centre - Leicester (UK); Derby Dance Centre - Derby (UK); International Children‘s Theatre and Dance Festival – Djanogly Theatre – Nottingham (UK); ARTEMREDE Teatros Associados - Centro Cultural do Cartaxo - Cartaxo; Cine-Teatro de Almeirim- Almeirim; Cine-Teatro S. João - Palmela; Cine-Teatro Virgínia – Torres Novas; KinderKinder Festival - Kampnagelfabrik – Amburgo (Germania). 2006. Internationales Theater Festival Glauben – E-werk – Freiburg (Germania); Mermaid Arts Centre – Bray (Irlanda); Baboró G. Int. Arts Festival for Children - Black Box Theatre – Galway (Irlanda). 2007. Festival Storm op Komst De Warande Theatre – Turnhout (Belgio); Spring Festival – Danscenen – Copenhagen (Danimarca). 2008. La maison de Comoni - Les Revest les eaux (Francia). 2009. Theater de Vest – Alkmaar (Olanda). 2010. Le centre culturel des Portes de l’Essonne – Athis Mons (Francia); Théatre de l’Agora - Evry (Francia). 2011. Théatre Louis Aragon – Tremblay (Francia). 2013. Théatre de l’Isle – Isle d’Ableau (Francia). 2014. Cinema Teatro – Chiasso (Svizzera). 2017. Palazzo Castelmur - Stampa (Svizzera). 2018. Festival Les Coups de Théâtre - Montreal (Canada); Centre National des Arts - Ottawa (Canada). Romanzo d’infanzia (1997) and Fiaba buia (1999) are the joint creations of Bruno Stori, Antonella Bertoni, Michele Abbondanza and Letizia Quintavalla. Silvano Pantesco contributed to Fiaba buia. The performances are self-produced and involve all the artists to the same degree. We would like to stress that they do not belong to one specific area of theatre (dance, prose or music), but to ‘theatre’ in general. This means the various elements converge within the show as a whole. This notice is an attempt to be informative but also to clarify an artistic/productive concept that has rarely been understood and accurately presented to audiences by organisers, directors or theatre critics (we have an endless supply of errors regarding either roles, specifications or names on programmes and in the press) during the years spent on tour. The cultural nomadism and instability we have actively pursued as single artists who unite for a time and then disband again, meeting only when we really have something to say together has not really been sufficiently underlined. Self-production requires great effort, but above all it takes hard work to find and develop artistic liasons, so we would like to draw attention to the fact that these are not ‘marriages’ or stable relationships where one partner takes on the surname of the other, nor are they directing assignments or choreography contributions that complete the work of one of the parts. Instead they are a union governed by reciprocal respect and a curiosity to explore the unknown or unexpected forms our work can take. For reasons of practicality, or by error, it is also common for the artistic parentage of a show to be attributed to the distributional structure only. Of course the layout and graphics for a theatre’s seasonal programme are much simpler to deal with when just one name or label or genre is mentioned! But in this way the chance to move beyond standard interpretative and critical assessment of the work is lost. We constantly meet with great difficulty in making sure that what we write to accompany our work (posters - information - notes) is understood and respected. More accuracy of form and greater sensitivity of content is necessary. Artists are famously touchy and obsessive. They love their work and anyone who dares touch it should be careful. We need recognition for our poetic paths and above all for the effort required to make detours, sometimes to encounter different creative roads from our own. Audiences should be given exact information on ‘what’ and ‘who’ they are going to see, who has produced the performance and who created it. When we were born we were given names: they are dear to us. Each of us has years of work in the various arts behind us: they are dear to us. So it is not good enough to make a mistake and say, for example, that ‘directors and authors will dance in the streets of this or that town or city…’, or to throw the lighting consultant in with the choeographers. One of our names has been wrongly spelled on six different occasions...even worse, people with determining roles in the creation of a performance have sometimes been omitted altogether from the credits, or mixed up, and when a show is co-directed, one or the other director is often left out. Why? If an organiser or director is more familiar with a particular artist and their work, the others are often forgotten. It certainly is easier to remember one name than four or five, but so what? Were we put on this earth to take the easy way out? There is an artistic fellowship between us, and let no press office divide what respect has united - that is something we really do care about. Romanzo d’infanzia won the 1997-98 elementary school category of the Stregagatto Prize for children’s theatre. 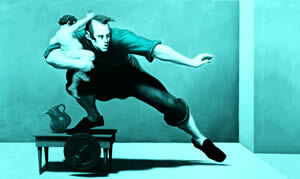 "A performance of considerable aesthetic quality combining theatre and dance with intelligence and sensitivity. Interpreted with talent and generosity, the work affects children (and adults) deeply by touching on the way they identify with things and their need to fraternize and seek freedom and autonomy. Romanzo d’infanzia offers young audiences an accessible, pertinent and intense artistic experience. A real pleasure".